Crusaders Quest is a deep and featureful RPG (role-playing game), very close to the traditional jRPG (Japanese style) type of games. Cute 8-bit characters, interspersed with cute anime-like cutscenes give it a definite classic feel. The game has a set of quests to tackle while you learn the dynamics and basics of the game: hero selection, weapon choice, powerup selection, leveling up… There’s plenty of things to learn in the game, and a pretty interesting side story to move you through the learning. As part of the learning, you’ll get to know the basic game mechanics. Fighting is automatic, and handled through enemy waves. 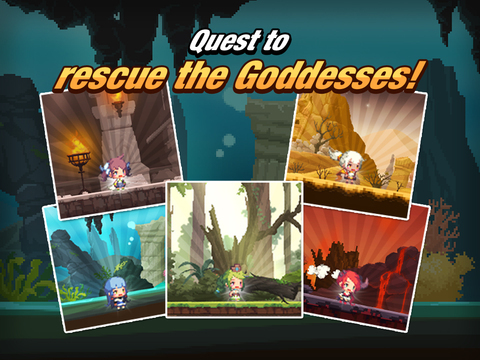 For each battle you can choose up to 3 heroes and (I think, so far I only have one) a goddess (as you advance through the story you get more of them to choose among). Once in battle you can control a little more of the battle through a minigame where you play match three with your heroes’ special abilities. 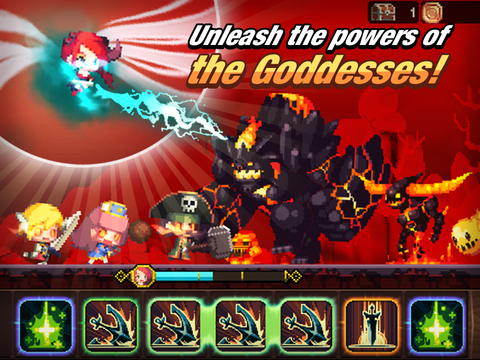 This also fills special hero powerups and goddess’ powers, which you can unleash any time. You need to carefully plan this, to be able to handle the final wave boss. Even if this seems complicated, battles are pretty straightforward and fast-paced. So the game suits as well for quick breaks or pauses or for somewhat longer playing sessions. After these first levels, you are more or less on your own. You’ll be given random loot after some stages, and then leveling up your heroes, weapons and powers will be the main targets of your effort. There is a time limit (controlled via in-game ‘meat’) so you need to rest from time to time, or pay with in-game cash in the form of gems. In Crusaders Quest there’s a huge range of heroes split in several categories, like paladins, hunters, archers, mages and a few more. Each category has some low tier heroes, several higher ups and a legendary one. Among them you will find d’Artacan, Joanne d’Arc, Dorothy, Achilles, Alexander the Great and many, many more. All in all, Crusaders Quest is a very enjoyable experience! The game is long and offers plenty of heroes to level up, so you won’t be finishing Crusaders Quest quickly. 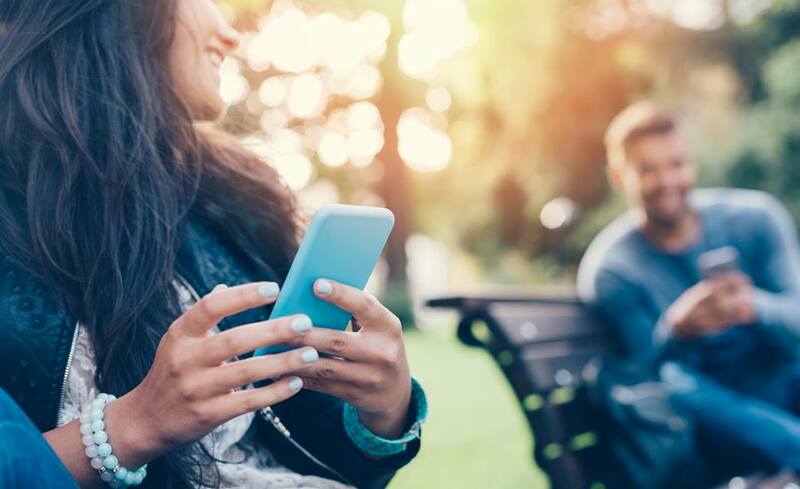 The game includes social aspects (and Facebook integration) to spice up a little more the gameplay and engage with some friends, or get their help if needed. 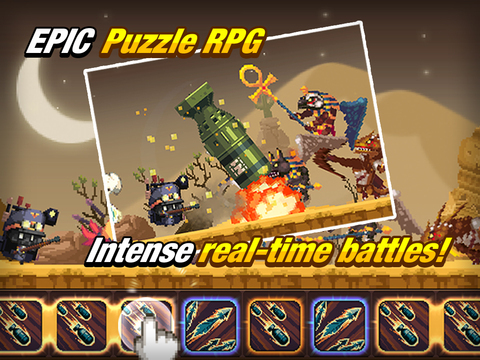 Match your way to victory in the new epic action RPG from TOAST, Crusaders Quest! 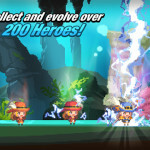 Command over 200 heroes and defeat waves of monsters in a quest to save kidnapped Goddesses from the forces of evil. 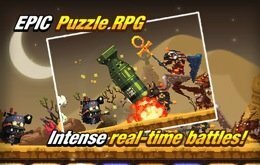 In Crusaders Quest, you will command the greatest pixel army ever assembled! 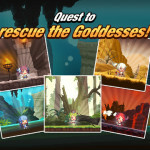 Save a land under siege by a mysterious witch who has kidnapped and trapped the magical Goddesses. Only you and your rag-tag group of 8-bit crusaders can journey to save the Goddesses and unlock their special powers to repel darkness from the land. After strengthening your heroes, take them into epic PVP battles to test your strength against the world! 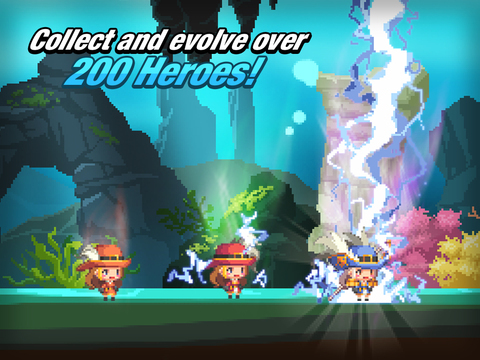 With over 200 heroes to collect, there's no limit to the combinations of crusaders you can take into battle! 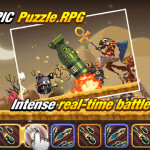 •	Real-time and fast paced puzzle combat! 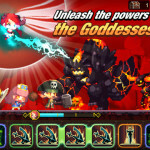 Match your heroes' skill blocks to quickly decimate your foes. 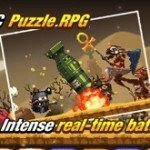 •	Play 6 unique classes and recruit over 200 unique heroes, each with their own strengths on the pixelated battlefield. •	Quest to save the kidnapped Goddesses and add their powers to your team. 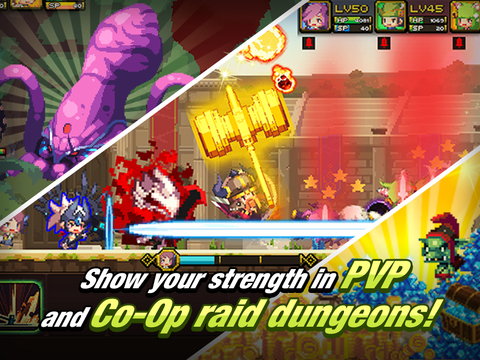 •	Level up your characters and equip hundreds of powerful weapons to strengthen your 8-bit crusaders! •	Beautiful 8-bit pixel graphics that capture the retro feel of classic RPGs. 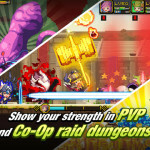 •	Challenge your friends for Honor in the PVP arena and see who has strongest heroes! 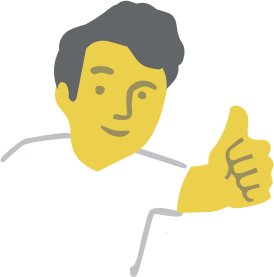 Brendon Elbert Martins is a web designer and portrait artist who likes to write reviews in his free time. If you ever visit Prairie du Rocher say him hello at the café! 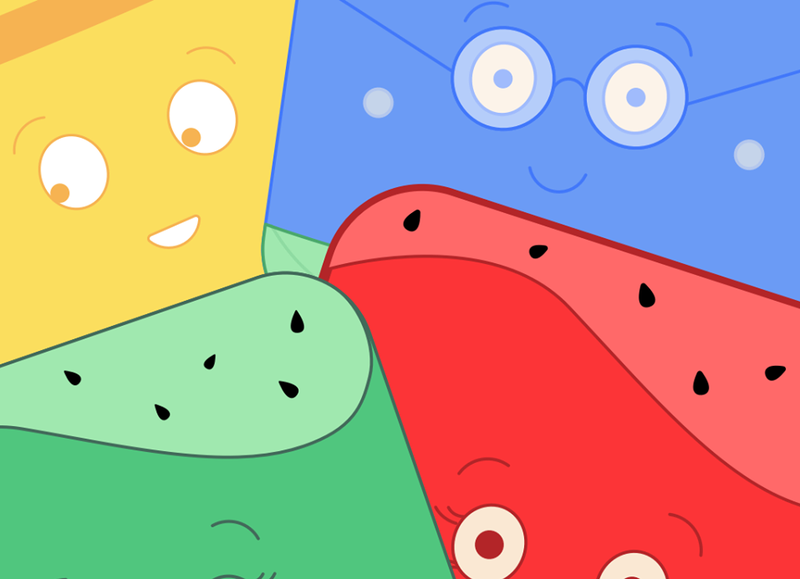 bemartins	has written 10 awesome app reviews.